A group of Polish members of parliament have submitted a bill seeking to proclaim Jesus Christ king of their overwhelmingly Catholic country. Forty-six deputies - 10% of the lower house - signed the bill, which was tabled earlier this week, reports say. Some Polish clerics however have criticised the move as unnecessary. If the bill becomes law, Jesus will follow the path of the Virgin Mary, who was declared honorary queen of Poland by King John Casimir 350 years ago. The motion has been backed by MPs from the far right League of Polish families (LPR), the conservative Law and Justice (PiS) party and the Peasants' Party (PSL). 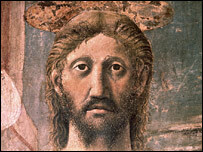 They argued Jesus should be made king on both theological and historical grounds. PiS deputy Artur Gorski said colleagues were "praying in the parliamentary chapel for [Jesus'] coronation", Reuters news agency reported. But Monsignor Tadeusz Pieronek, a member of Poland's episcopate and rector at Krakow's Papal Academy of Theology, dismissed the move. "Christ doesn't need a parliamentary resolution to be the king of our hearts," AFP news agency quoted him as saying. "These lawmakers would do better to look after their constitutional prerogatives and let religious institutions and the Church do our work," he said.